More than a year after Parliament passed the Compensatory Afforestation Fund Act 2016 (CAF), the Ministry of Environment Forest and Climate Change (MoEF&CC) is yet to roll out the mandatory rules to implement it. In fact, the ministry in November asked an extension till January 3, 2018, from the Rajya Sabha Committee on Subordinate Legislation to finalise the rules, which set the deadline of June 2017. “The proposed rules are currently with the ministry’s integrated finance division,” says D K Sinha, inspector general, forest, MoEF&CC and memeber of the Compensatory Afforestation Fund Management and Planning Authority (CAMPA) (see ‘No end in sight’). In the absence of the rules, forest departments in at least 15 states are undertaking afforestation as per the state CAF guidelines released by MoEF&CC in 2009, which are silent on the fundamental question of what kind of land—forest or revenue—can be used for carrying out the drives. As a result they are using the funds under CAF to take charge of forestlands that are being considered for community ownership and management, under the Forest Rights Act, 2006 (FRA). At present, the fund under the Act, which makes afforestation compulsory to compensate for the forestland diverted for non-forest purposes, has Rs 42,000 crore of which 10 per cent should be with the National CAMPA and the remaining with the state CAMPAs. 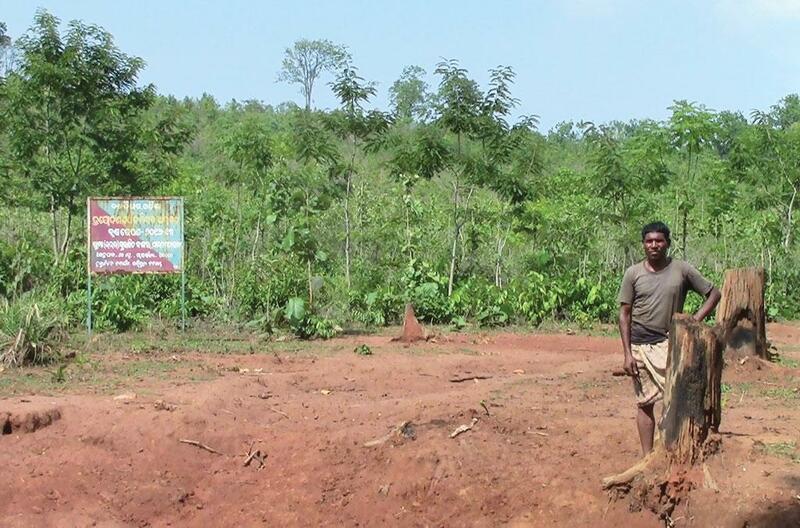 “Odisha forest department is using CAF to fence land over which local communities have claimed rights. Then they are using the land for plantations,” says Sanghamitra Dubey of Vasundhara, a non-profit working on tribal rights in Odisha. As per Vasundhara data, the forest department has started plantations in forestland in at least 10 villages in Kalahandi district. It says residents in nine of the 10 villages have already applied for community forest rights. “Except from one village, the forest department did not even consult the gram sabhas (village council) before diverting the land for compensatory afforestation,” says Dubey. When Down To Earth spoke to Sudipto Das, the state’s chief conservator of forest, CAMPA, he said he had no knowledge about the conversions because he had “recently joined the department”. The state received Rs 241 crore under CFA in 2016-17, of which it has spent close to Rs 2.97 crore for 48 afforestation drives. “Compensatory afforestation as a concept never incorporated the idea of public participation. This has become complicated with the introduction of FRA, which allows people to claim rights over forestland. Now there is a clash between the two laws,” says Kanchi Kohli, legal research director, Namati Environmental Justice Programme, Centre for Policy Research, New Delhi. In another incident, Odisha forest officials in February this year fenced and planted 60,000 teak saplings in a 300-ha forestland that provides livelihood to the residents of Pidikia village. The gram sabha wrote a letter to the state schedule tribe and schedule caste development department after which the forest department allowed the residents to enter the forest. “The forest traditionally has mahua trees and introducing teak might hamper the ecosystem. Also, residents cannot trade in teak as it is regulated in India and only the forest department can sell it,” says Dubey. Das says the plantations under CAF are approved by a steering committee and that “all the rules are being followed”. Similar incidents of plantation are also happening in Jharkhand. In Gumla district, 50 ha of forestland was brought under afforestation projects in July 2017. “Around 50,000 saplings of teak, acacia and sisso have been planted here. The plantation was done under CAF,” says Mahadev Oraon, the forest ranger in-charge of the district. Meanwhile in Uttarakhand, the forest government is planning to set up plantations on land held by van panchayats (forest council). “The idea was discussed in a meeting between the principal chief conservator of forests and the state forest minister in August due to the lack of land in forests,” says Tarun Joshi, an Uttarakhand forest rights activist. Plantation drives are also being undertaken on community forestland in North Gujarat’s Sabarkantha district, Karnataka’s Mysuru district and Chhattisgarh’s Kanker district. Activists, however, say whether the plantations are being done under CAF is yet to be ascertained. The exploitation by the state forest departments could have been avoided if the ministry had released the rules in time. When the bill was introduced in Rajya Sabha on May 8, 2015, many members had expressed their concerns over its discordances with FRA, lack of livelihood generation and eviction and poor participation of local communities during compensatory afforestation drives. In response, then Union environment minister late Anil Dave had assured that the rules will incorporate all the suggestions. He also promised that the gram sabhas will be consulted in deciding the plantations. But the draft rules, uploaded in August on the Maharashtra Forest Department website, were silent on the consultation role of gram sabhas. Facing criticism, MoEF&CC distanced itself from the draft. But a source in the ministry says the zero draft rules of CAMPA were shared with all states in April. On May 31, members from all MoEF&CC divisions convened an internal meeting to discuss the rules. The meeting was also attended by the principal chief conservators of forest from several states. Despite the closed-door meetings, the ministry is unlikely to meet even the extended deadline on January 3, 2018, because it is yet to go public with the draft rules that need to be put in the public domain for at least two months for suggestions. Till then, the rights of the people remain at stake.